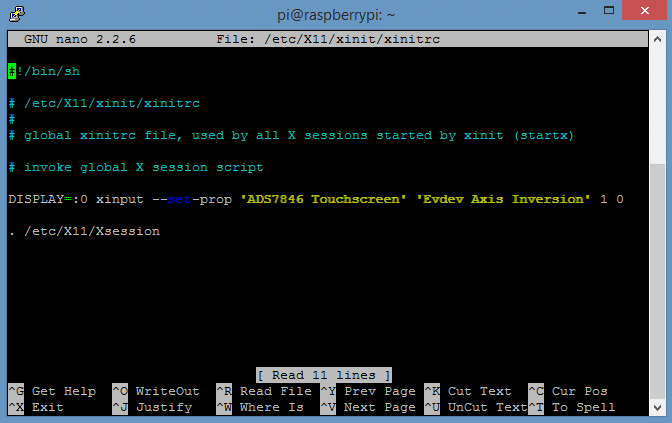 Press Ctrl-X then Y to exit nano and save the changes, then enter sudo reboot or sudo poweroff to reboot the Pi. However, if you try to touch the screen now, you will find that the pointer movement does not correspond to your finger movement. This is because the LCD screen driver and the touchscreen controller driver have separate settings for screen rotation. We need to change the rotation of the touchscreen controller driver to match the rotation of the LCD screen driver. 2. You probably noticed that dragging your finger to the right moves the pointer up, not to the right. This indicates that the x and y axes of the touchscreen are swapped. To correct this, we need to swap the x axis for the y axis. This can be done by changing the swap_xy=X parameter in /etc/modules. 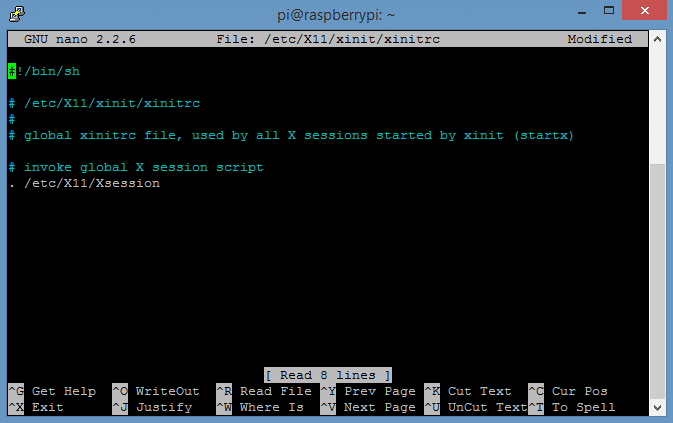 Press Ctrl-X then Y to exit nano and save the changes, then enter sudo reboot to reboot the Pi. Now if you drag your finger around the screen, you will notice that the y axis (up and down) is correctly aligned with the motion of your finger. However, the x axis (left and right) is still inverted. To fix this, we need to install two more kernel modules, xinput and evtest. xinput is a Linux utility that will allow us to configure input device settings for the touchscreen controller, and evtest is an input device event monitor and query tool. After the Pi finishes rebooting, you should notice that when you move your finger across the touch screen, the pointer should follow correctly in both axes. 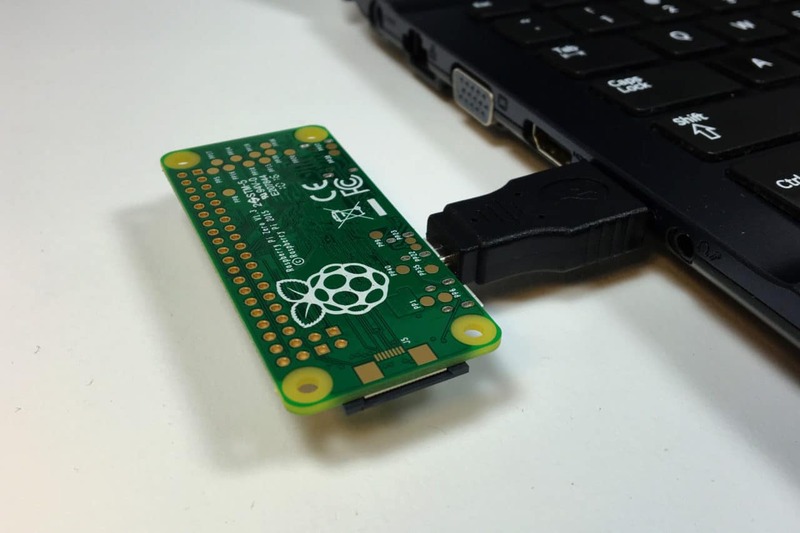 If you are using the Raspberry Pi 2 Model B, you will need to complete the calibration steps below before the pointer follows your finger correctly (and make sure that you have enabled startx to load automatically – see step 6 in this article). You can rotate the screen 90 degrees (as we did in this tutorial) and the power connector will be at the bottom of the screen, but you can also rotate it 270 degrees so that the power connector is at the top of the screen. To do this, simply enter fbtft_device.rotate=270 in the /boot/cmdline.txt file. Then change the DISPLAY=:0 xinput –set-prop ‘ADS7846 Touchscreen’ ‘Evdev Axis Inversion’ 0 1 line in the /etc/X11/xinit/xinitrc file to DISPLAY=:0 xinput –set-prop ‘ADS7846 Touchscreen’ ‘Evdev Axis Inversion’ 1 0. All you need to do is switch the values of the 0 and 1 at the end of this line. Now that we have our LCD touchscreen up and running, the final step in the installation is the calibration of touch control. This will make the pointer much more accurate and easier to use. This will create a configuration file called /etc/ts.conf, which contains settings for variance and jitter that can be changed to optimize pointer response. See here for information about configuring ts.conf. You will need to re-enter these two lines each time you want to use ts_calibrate or ts_test if you log out of PuTTY or reboot your Raspberry Pi. This calibration data will be written to a calibration file called /etc/pointercal. To view the contents of this file, enter cat /etc/pointercal at the root command prompt. Drag your finger or stylus around the screen to test the accuracy of the calibration. Press Ctrl-C to stop the test. If necessary, run ts_calibrate again to improve the calibration. Now enter sudo reboot at the command prompt to reboot, and you should be all set to explore the Raspbian desktop on your LCD touch screen! This is kind of a long process, but it is well worth it if you want to get the LCD touchscreen set up properly. So if you have any trouble setting this up or have anything to say, please leave a comment below. Also, if you found this article useful, please share it with your friends! So you are getting an error that says “selected device is not a touchscreen? What screen are you using? Thanks for these great step for step instructions. I followed completely. But I can´t change the Rotation of my Desktop. That´s not so hard as it´s already widescreen. What´s really bad is, I can´t change the Touch axis. I tried several Times, but it stays contrary. When calibrating, everything is fine and looks good, but not after reboot. I have this Display http://www.ebay.de/itm/3-2-TFT-LCD-Module-RGB-Touch-Screen-Display-Monitor-For-Raspberry-Pi-Board-/251686519220?pt=LH_DefaultDomain_77&hash=item3a99af81b4 (but without these 2 LEDs down at the switches). The provided Image uses Settings for “flexfb” and so I tried these. There´s written tontec on the Displays Backside, but it didn´t work with tontec settings. Would be great if you could help me to bring it to work. – the buttons on the side of the screen, do you have yours working? – have you managed to get the screen to wake up when touching the screen or one of the buttons? – when the screen goes to sleep have you figured out a way to get the backlight to switch off? I haven’t got this to work yet, but honestly haven’t looked into it very much. It would be great to get the buttons working and the backlight turning on and off with the shutdown command. Please let us know if you find out how! 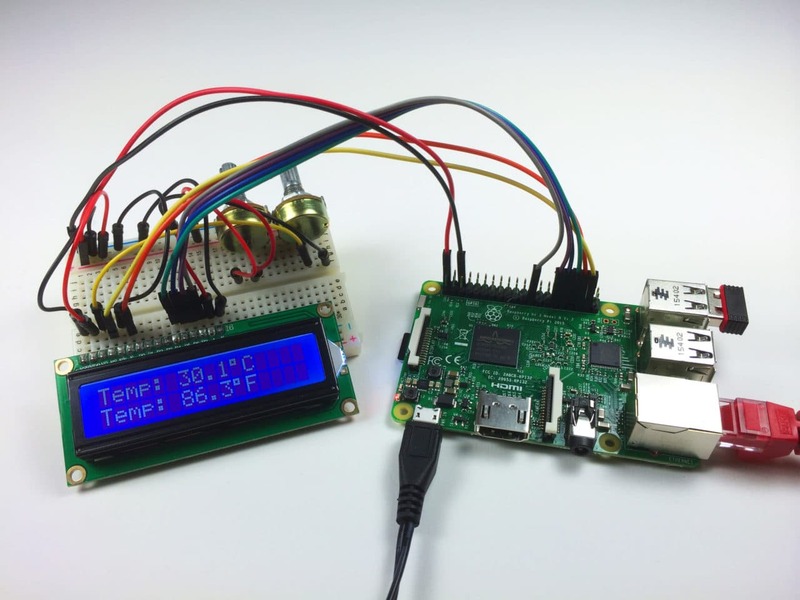 Buttons can be accessed directly via GPIO. On my WaveShare SpotPear v4 these are pins 12,16 and 18. I use the Waveshare 3.2 v4 on my RPi2 display and by the calibration with putty i have the same problem no touchscreen monitor i understand. I am an absolutly noob i have no idea whats happen. 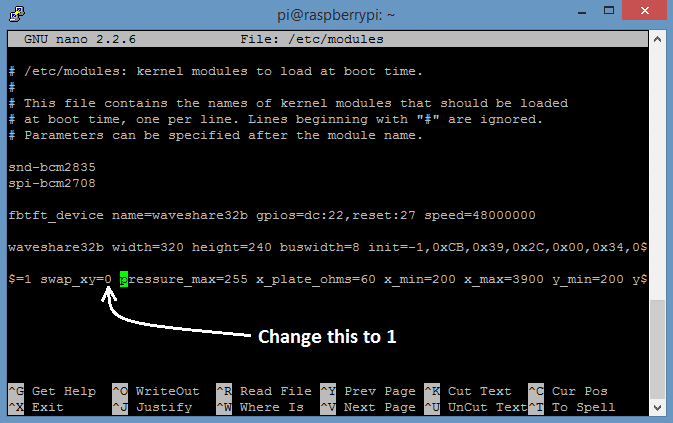 As I understand you need to run test directly on the rasbpi, typing that command through attached Keyboard. As when you run test from putty it will do scan for your computer monitor. Correct me if I’m wrong. In my case when I ran calibration from rasbpi directly, it show screen for few second with cross moving around and finish. and with test, it show cross on middle of the screen but no respond to test. Though when I run startx, it respond to touch correctly. I able to make if work on raspi2. Saying that , I still can’t progress through the calibration as it wont seem to respond to taps.Perhaps my display is faulty. Any Help, what I’m missing? how I can start program pointing to display it on touch screen? Is there a way to switch back to HDMI without undoing all the changes? I have gotten my Pi2 working with the waveshare via this and the other tutorial. I would like to setup some things with a full display and then use the TFT screen for more mobile things. did you copy the whole line. I make the same mistake at first and then copy the line by selecting all. 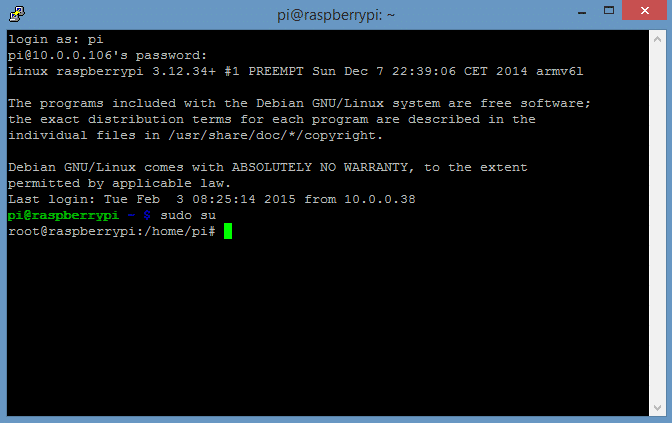 I’m using the waveshare 3.2 V3 on a Raspberry 2 b. The first part of the installation works fine. And I can also change the mouse movement when I follow these instructions. But the screen rotation doesn’t work. I’ve no idea how to fix that. Any ideas? 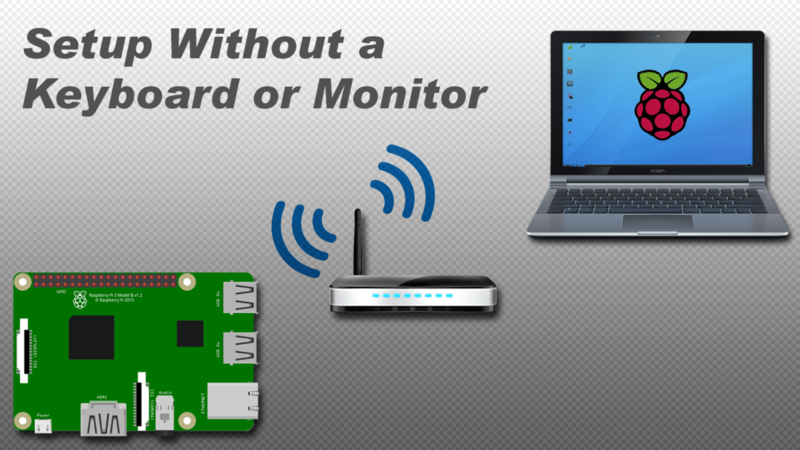 I’m using the waveshare 3.2 V3 on a Raspberry 2 b. The first part of the installation works fine. Screen rotation doesn’t work but the mouse movement when is not working ? Very clear and straightforward tutorial – many thanks. But – there’s always a ‘but’ – I’m getting the same problem as a couple of other folks, where I am not able to change the screen orientation. 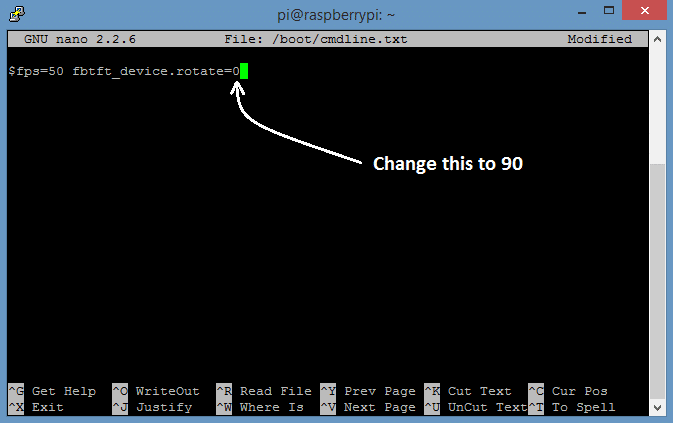 I have changed the value of fbtft_device.rotate to 90 and restarted, but the orientation doesn’t change. I wonder whether there has been a change in a recent OS update? I just went through the installation on a Raspberry Pi 2 Model B, using the Waveshare 3.2″ LCD touchscreen and the 2-16-15 release of Raspbian. Everything worked ok, however I noticed that sometimes I would need to poweroff and unplug instead of just reboot for the setting changes to take effect. 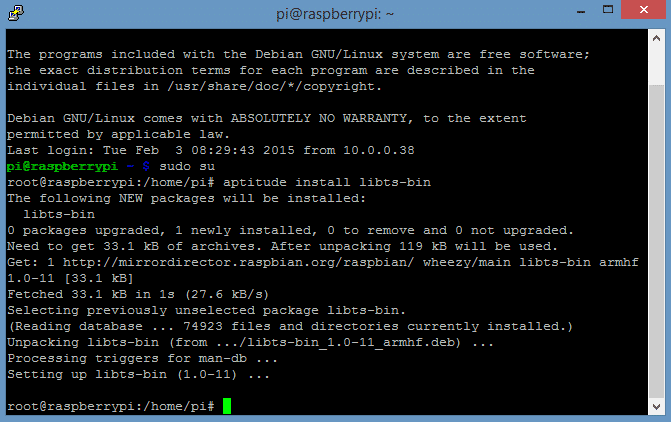 I’m wondering, what screen are you using, and what version of Raspbian? Well, the good news is that everything is now working very nicely. The bad news is that I can’t account for it. 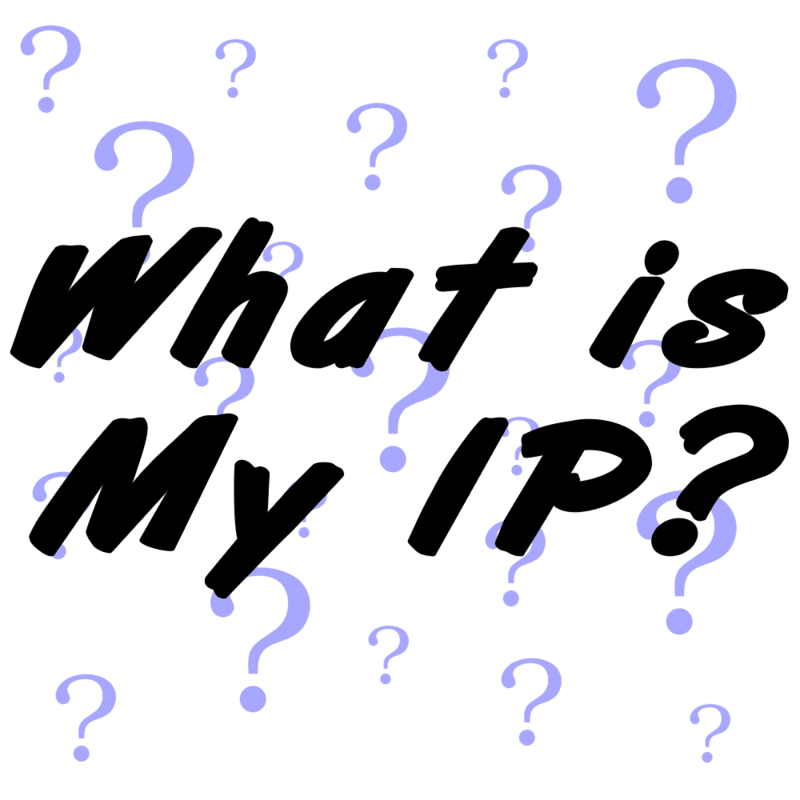 It may well have been down to a complete unplug and replug, although I originally thought that it may have been associated with having a blank line at the end of my /boot/cmdline.txt file. But I cannot reproduce the problem at all now, so I can’t be more help, I’m afraid. Apart from that little wobble, I’ve found this to be an excellent article, and very clear and straightforward to follow. All I need to do now is to finish implementing my menu system using Pi4J to handle the buttons. I installed on my TFTLCD32 (V4.1) got from BangGood and work perfectly. I set the rotation to 270 (Power connector UP) but I have ever the touch screen Y axes inverted. I tried all combination explained. (DISPLAY=:0 xinput –set-prop ‘ADS7846 Touchscreen’ ‘Evdev Axis Inversion’ 1 0) or 0 1 this in particular seems have not any effects. Someone can help ? 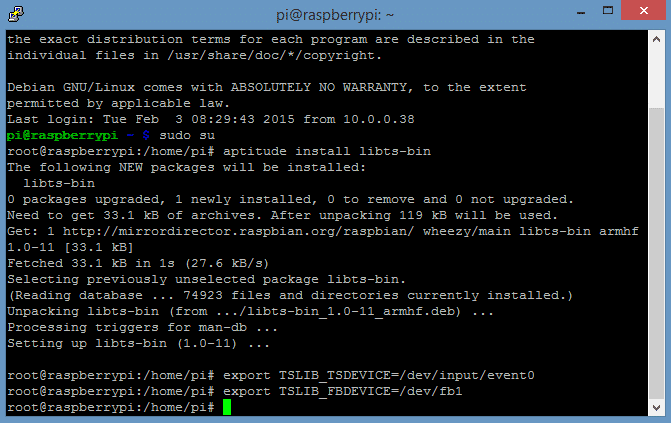 Also is possible to reduce the icon size on raspbian ? I fixed the inverted Y axes on touch screen. Thanks Thor, your instructions adding code on the /usr/share/X11/xorg.conf.d/99-fbturbo.conf fixed problem I had with inverted x-axis on my RPi model B + WaveShare SpotPear 3.2 inch LCD (V3). You have my deepest gratitude! I spent whole day trying to adjust the cursor movements for 270 degrees screen rotation. Finally I found your post and it made my day. (I am using latest Pi OS as of March 2016 with the proper 7″ screen). As an example this should get the 3 buttons working for anyone who needed them. Create a file by typing sudo nano /home/pi/switch.py enter the below text, save and exit, then enter sudo python switch.py to test. If working then add “python /home/pi/switch.py” without quotes to bottom of file before exit 0 to have it at startup….This is working on my Pi2 with 2015-02-16-raspbian-wheezy image. Thanks, I can see the output of buttons now. Now it would be easy to develop some applications. I am also using the same waveshare 3.2″ touchscreen as you are and I followed all the instructions clearly. I’ve successfully enabled the SPI display output and rotated the screen to my liking, thanks to your instructions and kudos for the same. Second, and the reason why I went to all the trouble, is the omxplayer wont play videos. I can only get the audio via the jack. FBTFT support is now in raspberrypi/linux. This release only adds SPI DMA support on top of that. That means that the touchscreen no longer works with the current exposed procedure. According to what noticed, dtoverlay was needed. But seems there are not life signal of the touchscreen. As I can see typing ls /dev/input where I can’t see the evdevx device. I’m not enough smart to find a clue, there are someone can help ? but the touchscreen doesn’t work anymore. I have a new problem..
Touchscreen now is working, and if I use in GUI X environment it track correctly. So if I start in console mode, and run a python pygame script that use touchscreen, it result totally uncalibrated and with Y axes inverted. I tried every procedure for calibrate the touch, but all seems related to X environment, but the python pygame script do not use X environment. So Where are the calibration info for non X env ? Also I’m unable to override calibration info that I don’t know where are. editing these files have not any effect, due X do not star at all. Someone have a ideas to suggest ? This install a really clean and fast distort, with full working display and touch, at the first try, without do nothing. I suggest to start with this image, then personalize it as you like. distort = distro damn corrector…. Also…. The only thing I need is to use this display with touch screen with a python environment with framebuffer graphic system and not X. So at the moment I never found the right way to use this display/touch as I need. The touchscreen work fine and it is calibrated in a X mode, but when I’m out from X in framebuffer, there are no way to get the touch calibrated ad tried any solution to fix it without success… So for the moment I continue to search a good solution. I have noticed that the calibration only works specifically for X. I think that may be the source of some peoples problems with it. Unfortunately I’m not sure how to calibrate it with a framebuffer graphics system, maybe someone else here knows? Need to get 0 B/33.1 kB of archives. Selecting previously unselected package libts-bin. So far it worked out well. Just running into following situation. When moving finger to the right, cursor goes left. Up/down works fine. ts_test works perfectly fine. Drawing and dragging just works fine. Having the exact same issue as NoBadDaysInSD. ts_calibrate and ts_test work fine. But X axis is still inverted after exiting/rebooting. Changing xinitrc seems to have absolutely no effect. Waveshare V4 on RP2. Found some details on http://blog.rot13.org/2013/12/touch-screen-configuration-using-xinput.html which is getting me further. Using ‘xinput list’, I found my touchscreen has an ID of 6. Then using ‘xinput list-props 6’ (6 being the id I found before, I looked for “Evdev Axis Inversion” and noted the ID (239 in my case). I then ran ‘xinput set-prop 6 239 1 0’, and the X axis started behaving (moving stylus to the left moved the cursor to the left). I put this in xinitrc, but again it seems to ignore this file when starting X. Had to add Option “InvertY” “true” to the touchscreen input class. after stage 3, when rebooted the screen would only work if also connected to hdmi. Any solutions? I am being used to screen 270 degrees. Whether touch is rotated 270. I do not know.Please teach me. I am using the same LCD and followed your tutorial. Have your tested the guide lately? Are you certain that it works? I see the boot messages on console but I get white screen as GUI starts. Below is the /var/log/messages after reboot. Could you please help? Oct 16 17:38:48 spare kernel: [ 11.653936] fbtft: module is from the staging directory, the quality is unknown, you have been warned. Oct 16 17:38:48 spare kernel: [ 11.691425] fbtft_device: module is from the staging directory, the quality is unknown, you have been warned. Oct 16 17:38:48 spare kernel: [ 11.824518] fb_ili9340: module is from the staging directory, the quality is unknown, you have been warned. 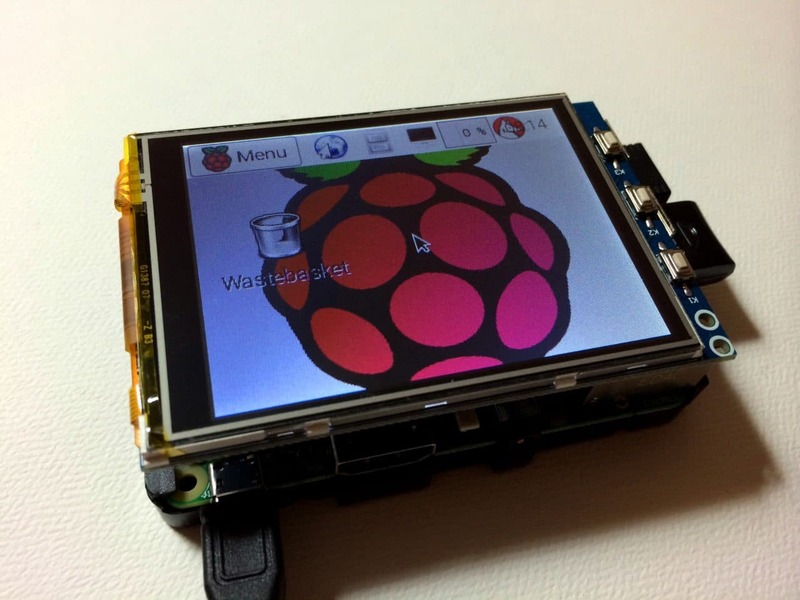 i am using raspberry pi 2 and waveshare 3.2 inch lcd. its all working fine. but the X axis is inverted after booting. Works like a charm. Otherwise I followed the excellent instructions. Thanks! BTW “VaihdaXY” can be anything, like SwitchXY. Can these same instructions be used for waveshare 3.5inch LCD spotpear. After poweroff the screen remain white how ca i fix that? Doesn’t appear to work with the Elegoo 3,5″ Touchscreen. The output is fine but only the touch input is 90° rotated it seems and I have no idea how to fix this. I use a 7 inch touchscreen display for my raspberry pi 3. I had to rotate the screen 180 degrees but now the touchscreen axis is backwards, please help. Very accurate description of the process. Piece of cake now to get my 5″ cheapo chinese TS to work. Mine listened on /dev/fb0 however, easy fix because it was the only fb device present. Will this calibrate an acer t232hl? When I am graphics program run in raspberry pi then there’s no problem in touch.but when I’m run this graphics program at boot time using desktop to cLi mode then this pointer is not correspond with my finger.